I enjoyed my many years working for BC Tel and like many employees and, for that matter, their friends, used BC Tel rope invariably turned up in our tool kits and garages. How could you tell that it was BC Tel rope you may ask? Well, it is a distinctive woven polypropylene of three very bright hues, yellow, blue and green. It is an excellent quality rope that is good for a wide variety of uses, including the many tasks that the construction crews handle in their outside plant work. Very early in my fly tying career, I learned that the rope, once the strands were separated, made an excellent attractor wet fly. I am not sure what the trout think it represents, perhaps to some a caddis pupae, but the fly does work at times and the recipe is listed below. Hook : 6 to 12. Tail : Blue poly rope strands. Body : Green poly rope strands. Hackle : Throat hackle of blue poly rope strands. Wing : Yellow poly rope strands. The first challenge is to obtain a small quantity of the classic yellow, blue and green BC Tel poly rope! You really don't need much, a couple of feet will do! However, it is wise to be discreet and ask your friendly telephone outside plant employee for a small amount rather than snipping away at rope left for the weekend at telephone construction sites! Once obtained, separate a few inches of the rope fibres from one end. 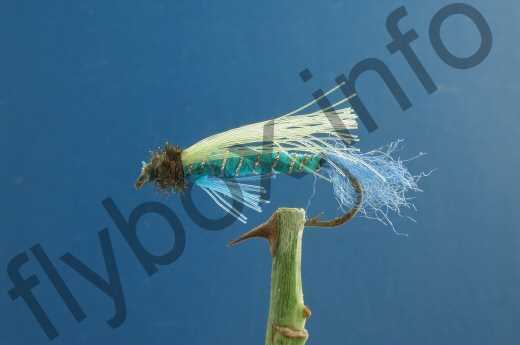 Start the fly by attaching 8 or 10 blue fibres to form a tail. If you wish, the tail and throat hackle fibres can be kinked by drawing the strands over the back edge of a knife blade. Next place a piece of gold mylar along the hook shank before attaching and winding on a dozen green poly fibres from the hook bend to the hook eye. Continue by winding the gold mylar in about 7 turns from the hook bend to the hook eye and tie off. Then place a few strands of blue poly and tie it in at this point to form a throat hackle. Next lay a clump of yellow poly strands along the top of the fly to form a wing and tie off at the hook eye. The final step is to wind in a few turns of peacock herl at the front of the hook to make a head, tie off, cement and you have just finished the BC Tel polypropylene wet fly that does catch fish! Currently there are no comments about the BC Tel Fly fly pattern from other fly fishermen yet.